Spiritual management is required for spiritual organization, and yet a ministry’s master plan should be the Master’s plan for that ministry. Church and Ministry Strategic Planning assists readers in developing a Biblically based blueprint for carrying out the many activities in which the church or ministry is involved. The authors show clearly how careful planning is inspired by the Scriptures (“Suppose one of you wants to build a tower. Will he not first sit down and estimate the cost to see if he has enough money to complete it?”--Luke 14:28) and how it improves making decisions today which ultimately affect the ministry’s effectiveness tomorrow. 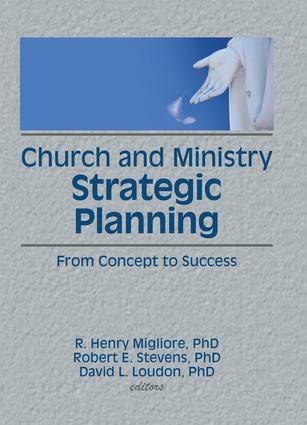 Church and Ministry Strategic Planning covers all areas of this type of planning and can be read and reviewed quickly. Through the use of a model of the strategic planning process, the authors show how to develop mission statements, define strategic objectives, develop strategy options and operating strategies, appraise performance, and monitor strategic planning. Readers are led step-by-step through these key areas of creating a strategic plan. Examples and worksheets at the end of each chapter enable pastors, administrators, and lay leaders to develop a strategic plan fitting to their specific ministry or church. The appendixes provide tools used in planning as well as a complete sample strategic plan for a large church. Explore this Biblical perspective on planning and develop a strategic plan that is systematic and continuous and allows the church or ministry to assess its market position, establish goals, objectives, priorities, and strategies to be completed within specified time periods, achieve greater staff and member commitment and teamwork aimed at meeting challenges and solving problems, and muster its resources to meet these changes through anticipation.